Mount Calvary Holy Church of America Inc., Washington, D.C. 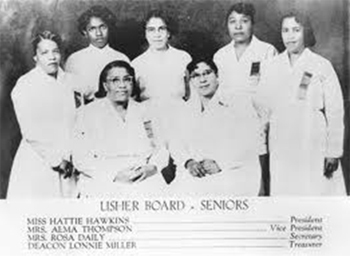 The role of the usher board (which can include a nurses guild) is considered one of importance and honor within black churches. Ushers are the first people we encounter during a worship service; they meet us at the door. They ensure that we are welcomed and comfortable. Their smiling faces and pleasant demeanors set the atmosphere for our worship experience. However, they do more than show us to our seat or tend to the congregation during worship. They are more than the collectors of the offering during worship. And their role is more important that readying the sanctuary in anticipation of that day’s worship attendees. The doorkeeper’s position is that of a spiritual conduit. The doorkeeper is the first responder to the people’s anticipation and expectations. Worshippers who are trying to make their way to be in the presence of God are affected by the first persons they see and the look on the faces of those persons. The kind of hospitality extended in the house of God represents the spirit of God in the house where each doorkeeper and nurses guild member serves. Ushers and nurses guild members are partners in the worship experience with other church leaders. These volunteers play an integral role in worship. Ushering can, at times, be a thankless job. However, it is very much a form of ministry within the church. This reality is clearly seen within black churches. Ushers are our first contact and our support throughout the worship experience. The work that is executed by ushers and nurses guild members starts well before attendees arrive. In most cases, ushers arrive at the church an hour before service begins. They are responsible for ensuring that the programs and offering envelopes are prepared and organized, that the pews and surrounding areas are neat and clean, and that “post” assignments are made for those participating within the ministry on that day. And once service concludes, ushers are among the last few to leave. Nurses guild members are typically responsible for the church pulpit and more and more are the first responders to persons who may faint or suffer other moments of physical distress in church. Many nurses guild members and ushers are now even certified to perform CPR. As a result of the work, sacrifice, and dedication provided by usher boards and nurses guilds, one day of every year is set aside for the church and its members to express their appreciation for the work and commitment given by these individuals. Often, ushers and nurses guild members from other churches will attend the festivities in support and celebration, and all programming is centered around showing appreciation to the usher board and all of its departments. We appreciate all who serve as nurses guild members and as ushers and are thankful as they assist in maintaining order and decorum and extending hospitality in the house of God. Regardless of one’s age, gender, sexual orientation, economic status, talents, etc., anyone is capable of serving on an usher board. And it is through ushering that many learn about order, precision, and obedience. In some cases, being on an usher board is similar to the military, without the physical training and head shaving. And these roles stretch all the way back to the Old Testament world of the Bible. Leslie Parrott writes, “Ushers in the Old Testament were called doorkeepers.”4 Throughout the Old Testament there are several references to doorkeepers in addition to Psalm 84:10: 2 Kings 22:4, Jeremiah 35:4, 1 Chronicles 9:19, and Ezekiel 40:45-46. Ushers either served the role of receiving the collection or were keepers who kept charge of the House of God. In the New Testament, we are provided with even more references, whether they were uniformed guards, or, in the case of the disciples, as they prepared the path for Jesus by “ushering him in.” Some scholars, like Parrott, believe the work of the usher is seen implicitly as well as explicitly throughout the New Testament. I must admit, I never really enjoyed being an usher as a teenager. However, I really had no choice. You see, in the church where I grew up, we all were required to be involved from as young as age five. If you were a young person in the church you were a member of the youth and mass choirs, junior stewards, and the youth/young adult usher board. One Sunday in the month we were required to “man the doors” of the church. As members and visitors entered, we knew our assignments. First, say good morning; then hand them a program and an offering envelope; then show them to their seats and wish them a blessed and enjoyable worship experience. As this all took place, she watched us from her seat in the front row. She was the woman we called “Big Momma.” She ran the Young People’s Department at our church. And she made sure everything ran smoothly. She had us spread about the sanctuary. Two always at the front door as attendees entered—that was the prime place that every youth always fought for—three along the walls on both sides, and two standing post at the front pews just steps away from the altar. You never wanted to be the two standing near the front pews. It was where people saw you the most. Every move you made could be seen. There was no way to hide from the eyes of those in the congregation. You were front-and-center. In the back you were able to get away with a few things. If you had to rush to the restroom, you could duck out rather easily. If you saw something that was amusing and you wanted to giggle, as teenagers often would do, you could easily do so and get away with it. But at those front two rows, you had to be serious, stoic, and lack emotion. Everything you did, someone saw you. It wasn’t that we did not enjoy the experience. But the fact that we were made to do something took away some of the fun. Also, we had to stand for most of the of the worship service; we were only able to sit down after the preacher gave his text, prayed, and announced the title of the sermon. Then and only then were we allowed to relax, but we still had to be aware of all that was going on. I mean, you never knew when someone wanted—or needed—something. Of course, it was the usher’s duty to oblige. I never truly understood how important the role of the usher was until I got older. As a youngster, it was a chore, something I had to do. But as I got older and especially after I started visiting other churches in the city of Atlanta, I realized how important and how necessary the role of the usher could be. There is one visit to a local church that immediately comes to mind. There was an older woman attempting to get the attention of one of the ushers. “Psst, ursha. URSHA!” (those who know the black church know that you often hear the word ursha or ursher and not usher). Anyway, the woman attempted to whisper unsuccessfully. It could have been an embarrassing experience for all involved, but the usher handled it professionally and gracefully. She made her way to the lady and engaged her so that no one was able to tell what they discussed or what the urgent need might have been. Now, some would suggest that it is silly for someone to consider a section of a pew as “their seat.” And I would submit that there is and was something remotely silly about it. My point is this, for an usher to ensure that I was happy and comfortable in “my seat,” especially given that the church was quite large, spoke volumes about the work and role of the usher. She made my time and my experience at that church special. It was as if it was her duty to ensure that my experience was positive every time I was in the sanctuary. It just goes to show how integral the role of the usher is in the worship experience. I may not have appreciated it as a teenager, but as an adult I have the utmost appreciation and respect for the work ushers do. Ushering is a ministry, very much a calling. And not everyone is cut out for it. I am glad she was. On Ushers—You Know You’re in a Black Church If. . . .
1. You know you’re in a black church if the usher hands you a Martin Luther King Jr. fan before you’re seated and the fans were donated by a funeral home. 2. You know you’re in a black church if the usher board has matching suits in at least four colors and the nurses guild wears nurses hats. 3. You know you’re in a black church if the pastor tells the ushers they may be seated during the sermon. 4. You know you’re in a black church if the ushers pass out the hymnals and take them up before service is over or they ask you to please leave them on the pews. 5. You know you’re in a black church if members of the nurses guild or an usher place a bottle of Olive oil on the side of the pulpit. 8. You know you’re in a black church when the ushers lock the doors during the offering. Come once again to me. I will draw near to You. Come on, go with me. http://www.youtube.com/watch?v=SrZAkLuN1HQ&feature=related (accessed 18 April 2012). http://www.youtube.com/watch?v=Gu_LdVjIPjk&feature=related (accessed 18 April 2012). http://www.youtube.com/watch?v=wLMc9hFLgxA&feature=related (accessed 18 April 2012). http://www.blueletterbible.org/lang/lexicon/lexicon.cfm?Strongs=H5605&t=RSV (accessed 24 March 2012). Online Etymology Dictionary. Online location: http://www.etymonline.com/index.php?term=usher&allowed_in_frame=0 (accessed 24 March 2012). http://theoldblackchurch.blogspot.com/2009/06/happy-ushers-day.html (accessed 27 March 2012). 4. Parrott, Leslie. Usher’s Manual. Grand Rapids, MI: Zondervan Practical Ministry Guides, 1970.
http://famouspoetsandpoems.com/poets/raymond_a__foss/poems/24123 (accessed 4 April 2012). 7. Lawrence, Donald. “Usher Me.” Location: Donald Lawrence and the Tri-City Singers. Go Get Your Life Back. Brentwood, TN: EMI Gospel, 2002. 8. Redman, Matt. “Better Is One Day.” Location: Darwin Hobbs. Worshipper. New York, NY: EMI Gospel, 2005. 9. Biggham, Milton and Jerry Smith “House of the Lord.” Location: Mississippi Children’s Choir. 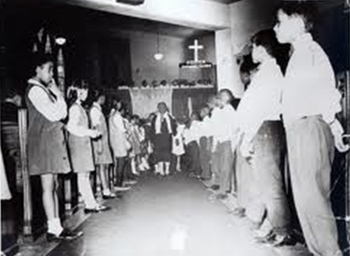 Mississippi Children’s Choir: When All God’s Children Get Together. Jackson, MS: Malaco, 1998.